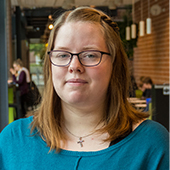 Karin Sahlin is a doctoral student in the Wallenberg Wood Science Center (WWSC), a joint research center at Chalmers University of Technology and the Royal Institute of Technology. WWSC's vision is to develop new materials from the Swedish forest. At Chalmers Karin is part of Gunnar Westman's research group and focuses on cellulose nanocrystals. There might be more projects where Karin Sjövold participates, but you have to be logged in as a Chalmers employee to see them.